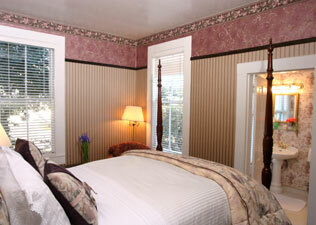 Bed and breakfasts in Mendocino California includes the pet friendly Abigail's Bed and Breakfast. Mendocino's newest value priced child and pet friendly Bed and Breakfast. Built in 1906 as a private home, Abigail's boasts 3 suites and 3 private rooms, all with luxurious linens, private baths and knockout views. It's high ceilings and large windows provide a feeling of luxury light, openness, comfort and spaciousness. Expect exemplary service and friendliness. Abigail's is in the heart of historic Mendocino and is virtually next door to the Whitegate Inn and two of Mendocino's finest restaurants. It is located within easy walking distance to all Mendocino's unique shops, restaurants and other amenities. We offer a truly memorable and relaxing vacation.